You might recall back in March 2014 we had Rob Kempinski visit from the US and do a demonstration on a Podocarpus. 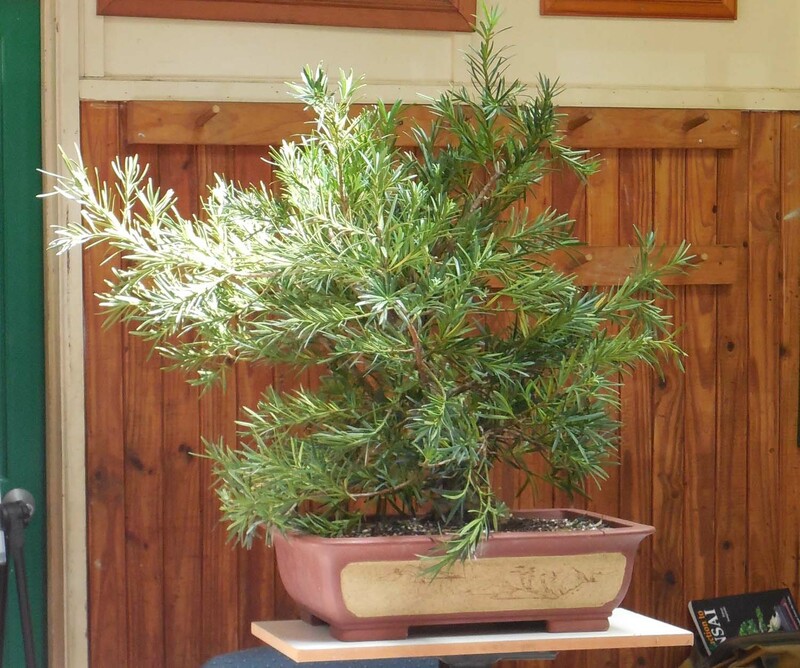 I think it's a Podocarpus macrophyllus, the Japanese/Chinese native rather than the Australian P. elatus. It is a club tree and has been in the care of one of our members since the demo. I thought you might be interested in one of those "what ever happened to?" stories, so here is the latest. The plan has been to develop it a little further before we raffle it off at the right time. This post is to provide an update on the tree's progress since that demo in 2014. This was the tree before Rob started work on it. It was a fairly wild challenging specimen having been ground grown and put in the pot some time before the demo, without a lot of training. And this was the result at the end of the afternoon. Having been ground grown the larger branches were quite straight and a challenge to restyle. The smaller ones though like all conifers were reasonably flexible. 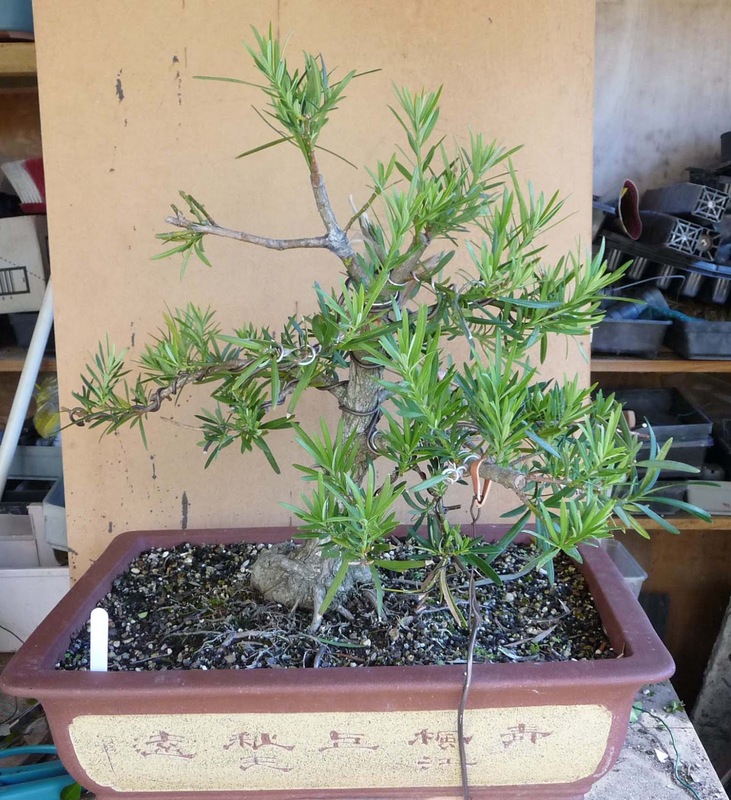 Some were a little disappointed in the outcome but Rob did say at the time that he only wanted to do so much, recognizing that the tree needed to recover for a dramatic pruning and recharge before the next stage of its conversion into a bonsai. Too many demos try to do it all at once, resulting in a pretty picture at the end but also a tree that may not survive. By the spring of late 2014 (7 months after demo) it had started to re-shoot again but only in a limited way and it seemed like as good time as any to address the tree's roots. When removed from the pot it was clear that not much was done when it was dug out of the ground; basically put in the pot with some fill around the edges. The rootball was a thoroughly packed lump of red muddy soil, which had to be removed if the tree was to develop well into the future. Fortunatley there was a good supply of close feeder roots. It also had a real knobbly trunk and no flare in the nebari. All the more reason to promote vigorous root growth from the trunk area by getting it into decent bonsai soil. Suffice to say the tree wasn't too happy with being left with not too many roots, and being bare rooted, but it had to be done. It was going to set the tree back again but it had to be done. Future root pruning, for an evergreen like this, should see a core of the the root mass retained and undisturbed. It sat there and did nothing but survive for a very long time. It wasn't until October 2015 (19 months after the demo, and 12 months after the root work) that it really produced a lot of new shoots. Ground growing is promoted as a way to expedite a tree's development but you have to also allow for recovery times for both the major branch pruning and root renovation and these can be substantial. These transitions can also be terminal. Here it was in early December 2015 with the flush of this season's growth. It was time to get that growth under control and set it up for another run through the summer. Let the pruning begin. This is another view down into the canopy. Here the work begins with the two lower branches; reducing extension, removing the clutter of excess secondary and tertiary branches, and then wiring to introduce some movement. Moving up through the tree not taking anything out until it was clearly not needed. And then getting to the top. This was the cutting room floor with probably more there than remaining on the tree. After the work the tree has good proportion in the branch weight and good depth, balance and branch density. The vigor of the lower branches matches the upper part of the tree, which will support future development. The priority now is to build a rounded canopy, more ramification and bring in the lower branches a little. With the momentum the tree currently has, much of this may be achieved this season. Perhaps next spring/summer (just another 12 months!) will call for a smaller pot and a raffle! !